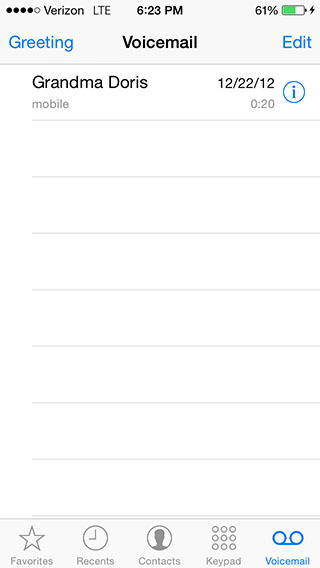 I don’t really like voicemail. If you leave me voicemails, I’m sorry. Chances are I rarely listen to the messages you record. I just call back to see what you want, usually deleting the voicemail without a second thought. I’ve done that with all but one message that’s been sitting in my voicemail box since December 2012. It’s from my Grandma Doris. It’s not a super important message or anything. She’s just checking in to see how my packing was progressing — I was preparing to move back to California from Wisconsin — and she wanted to know if I’d see her the weekend after Christmas. And, because she’s my grandma, she told me she loved me. I don’t know why I never deleted it. For some reason, it was always a comfort to see “Grandma Doris” in there whenever I went to toss voicemails. Now I’m really glad I did. I got a call from my mom yesterday who heard through the family phone chain that my grandma was sick and the outlook wasn’t good. It wasn’t a call I was expecting and hit me hard in the moment. It pales in comparison to the call I got from my cousin Sara this morning at around 4:30, though. My Grandma Doris is gone now and it’s not something I was even remotely prepared for. But, as a writer, I’m doing what we do to cope: I’m writing my thoughts down to get them out of my head for a little while. Grandma Doris was truly one of the coolest people I’ve ever met. My earliest memories come from a family trip we took to visit her and my dad’s side of the family in Wisconsin when I was two. That trip was so good that it imprinted itself on my brain forever. We made other trips in the years that followed, but living in California meant there was always a bit of a disconnect with that side of the family. Then I found myself moving to Wisconsin in 2009. It was a new adventure for a few different reasons. I was attempting to build a life somewhere new and looking for a job. The secret mission for me though, was to get to know the side of the family I’d met before on a number of occasions, but never had the opportunity to really know. It started with a drive up to the top of Wisconsin not long after I arrived. I went straight to my Grandma’s house and as I arrived to her apartment complex, the first thing she did was give me a hug. Wait, that’s not true. The first thing she did was walk to a different door than I was at. Confused, we talked on the phone for five minutes before I realized I was across the street at some other building that was definitely not her apartment complex. Together, we went to my aunt and uncle’s house the next day and I got the full-on family introduction. Everyone was older than they were when I was barely a teenager, of course, but I immediately felt welcomed. That visit also happened to coincide with a party celebrating my cousin Emily’s senior year of high school. That’s where the picture above was taken. 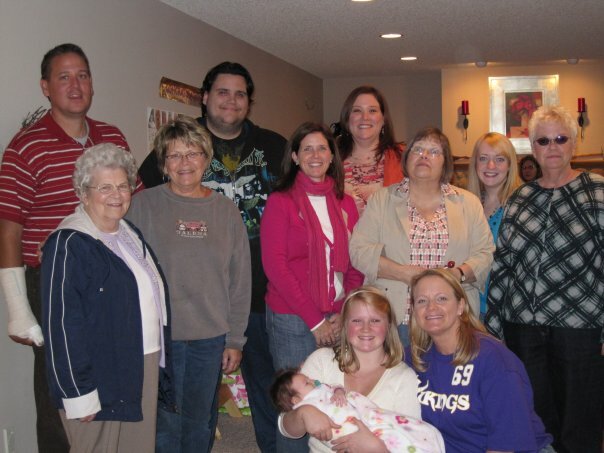 I’m the guy in the old Aerosmith hoodie, Grandma Doris is the lady all the way to the right. You know, the happiest looking person in the room. This was the first of many really great times I got to have with my Wisconsin family throughout the three years I lived in Madison. I went up there for long weekends, holidays and even ice fishing — just once for that, though. I couldn’t afford to flip any other cars, no matter how much fun the trip was. Everybody was happy and smiling and just excited being around each other. After dinner, everyone gathered around to watch football and plan their shopping out for Black Friday. It was awesome and something I was happy being a small part of. Still, every single time I was there the highlight was getting to spend some time talking to Grandma Doris. She’d ask me if I’d found a nice girl to settle down with yet, I’d laugh and say no. She’d ask how my dad was doing or about things she’d been told I was writing about on Facebook. She was, for lack of a better term, a grandma. And I am very glad to have had her. I’m happy I got to go to her 90th birthday party and have a greasy breakfast with her at a diner near her house. Happy she liked my dream idea of buying the out-of-business movie theater in Amery and reopening it. I was so excited to be planning a return visit to Wisconsin — my first since moving back to California in January 2013. I was stoked to go to the family reunion and spend some time seeing everyone, catching up on lives and just being around the family. Instead, I’m flying out for a short visit Thursday afternoon to attend her funeral. Don’t get me wrong, I’m happy I get to see my family and reconnect with people I don’t talk to nearly enough — even if Facebook does help. I just wish it were under better circumstances. And I wish she were there to talk to. She will be, though. I just might not be able to hear her voice. But that’s fine, I have my voicemail and it’s not going anywhere. The time I won Big Brother.